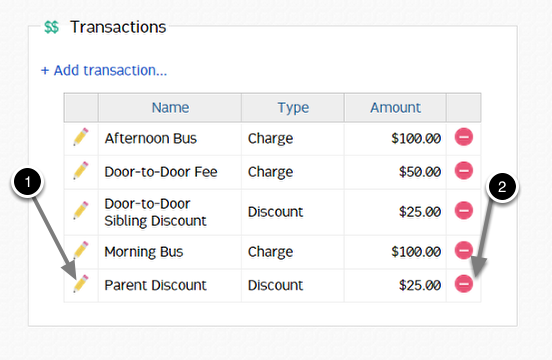 Transportation Transactions will result in charges or discounts automatically being posted when a transportation form is submitted based on a combination of criteria that a camper must meet. 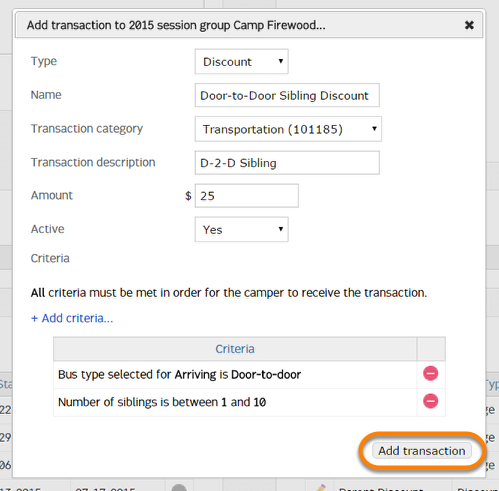 Transportation transactions can be created by selecting +Add transaction... on the Session Group page. Active - if set to "Yes", the transaction will be applied when the parent submits the transportation form. If "No", the transaction may be posted administratively when enrolling a camper in Manual processing mode, or on the Camper Profile Page. 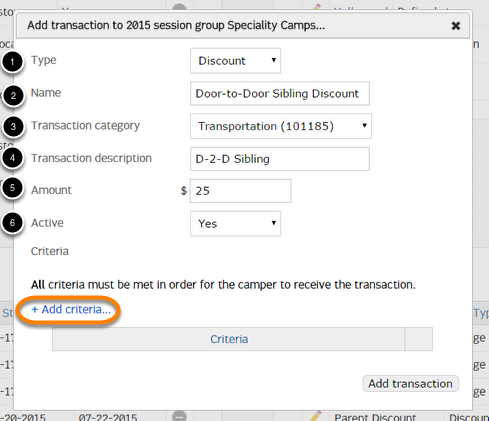 Clicking +Add criteria... allows you to set the criteria a camper must meet in order for the transaction to be applied. A variety of criteria can be applied for each transportation transaction. A camper must meet all criteria in order for the transaction to be posted to their account. Method - Applied if camper selects a certain transportation method. Bus - Applied if camper selects a certain bus. Bus type - Applied if camper selects a certain type of bus (e.g. 'Central location', 'Door-to-door'). Session - Applied if camper enrolls in a certain session in the session group. Session count - Applied if camper enrolls in a certain number of sessions in the session group. Sibling count - Applied if a certain number of the camper's siblings have signed up for the same transportation method in the session group. Before date - Applied if the transportation form is submitted before the given date. After date - Applied if the transportation form is submitted after the given date. After adding the criteria, click Add transaction. The new transaction will be listed. Double-click the pencil to view transaction criteria or change the active status. Double-click the minus sign to delete the transaction. Transactions may not be deleted once they are in use by a camper.